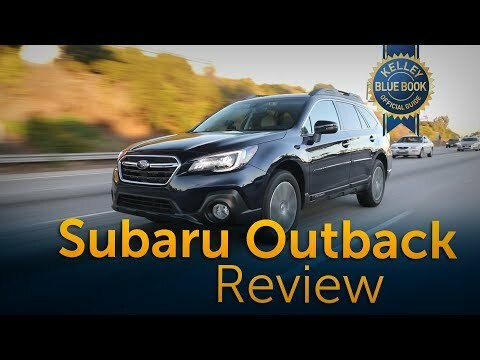 The 2018 Subaru Outback crossover SUV is quite possibly the most recommendable vehicle for the broadest range of buyers and tasks. It's spacious, efficient, comfortable, a great value in the near and long term, and -- thanks to standard all-wheel drive and excellent ground clearance -- can tackle any road or weather condition. I love my Subaru outback! I thought I wanted another Jeep, however had some interest in Subaru because a friend raved about her crosstrek and I had a friends and family discount through my dad who works at Subaru. After test driving the outback, which was similar in size to my Jeep grand Cherokee, I didn't even go to the Jeep dealership to look. The Subaru dealership was friendly and attentive and I was able to get all of the features I wanted at the monthly lease payment I could afford. I feel safe know my Subaru is top rated in safety. And, the drive assist features such as pre-collision braking, adaptive cruise control and lane departure and sway warning were features I didn't think I needed, but have grown to love. The adaptive cruise control is great for long road trips or bumper to bumper traffic. And, the pre-collision braking and lane departure and sway warning might seem premature at times, they are needed with all the distractions in today’s connected world. The gas mileage is amazing. I do not drive a lot either so a full tank can last me from two weeks to a month. And, when I make a trip to my parents, about 300 miles round trip, I have 150-200 miles leftover from a full tank. The harman kardon audio system exceeded my expectations as well. And, I love that apple carplay comes standard. Plus, the touchscreen is easy to navigate and Bluetooth and voice controls allow me to stay connected while driving. I am excited to lease the ascent next! My first Subaru and why I am a Subaru driver for life. I honestly never thought I would buy a Subaru because I didn't really hear much about the company or the quality of their cars however, now that I have owned my outback for a year now I do not want to be in any other vehicle. It is perfectly designed inside and out. Seemingly smaller looking on the outside which is nice because it is easy to fit in narrow parking spaces but it feels like the interior space is like that of a full sized SUV. All the materials are visually appealing and well designed inside and out making it feel very luxurious. I especially love the fact that the chassis is just wide enough to make the outback feel safe around tight turns and bumps are much smoother. The all wheel symmetrical driving, incredible turn radius, high quality gas mileage and a countless number of additional features make this car my number one choice. There is quite honestly nothing yet that I have discovered that bother me and I have owned it for skittle over a year now driving at least 30-50 miles a day. But do not just take my word for it. Look it up for yourself and see the millions of Subaru owners and their reviews. There is a reason why Subaru owners never want to get rid/sell their Subaru. High quality, luxurious, extremely safe, and overall a pleasure to drive. A great mommy wagon! So much room for stroller, car seat and groceries. The outback is smooth and surprisingly smooth ride. Handles on a dime. Has eyesight and collision detection which is great for safety! I do wish instead of it “beeping” to alert me to lane departure, it would vibrate to alert me. Love the volume control button on the steering wheel cause it is raised instead of flat. The driver side seat has great lumbar support. Both front seats are adjusted automatically. All seats are heated and the steering wheel is heated. Perfect for those cold mornings. Wish the rear view mirrors automatically fold in if needed. Wish it had more front end sensors. The trunk is so spacious and if I put the back seats down. . . I have so much room.